As many of you know, this blog has primarily been a place to share stories and photos from my trips, but my next trip won’t be for at least a couple months. So until that time comes, my blog will be more of a practical guide to backpacking. Or with the direction my life has taken, a practical guide for the deliberately homeless. Either way, I've learned a lot from my experiences and I love to chat about this stuff. I get a lot of questions and could spend hours answering them, as many unfortunate people have realized after asking me a seemingly simple question. 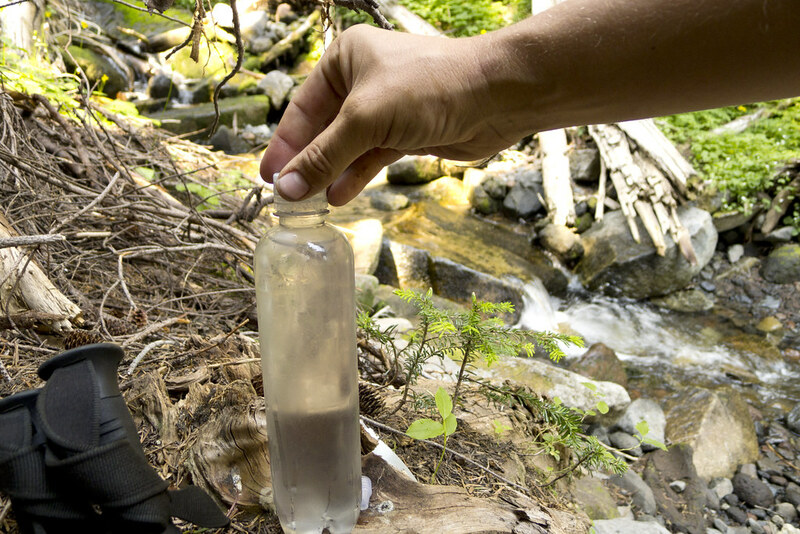 Many of the questions I get involve obtaining safe drinking water in the backcountry. When I tell people I use common household bleach, they often look at me like I have a death wish. So that's where I'll start. 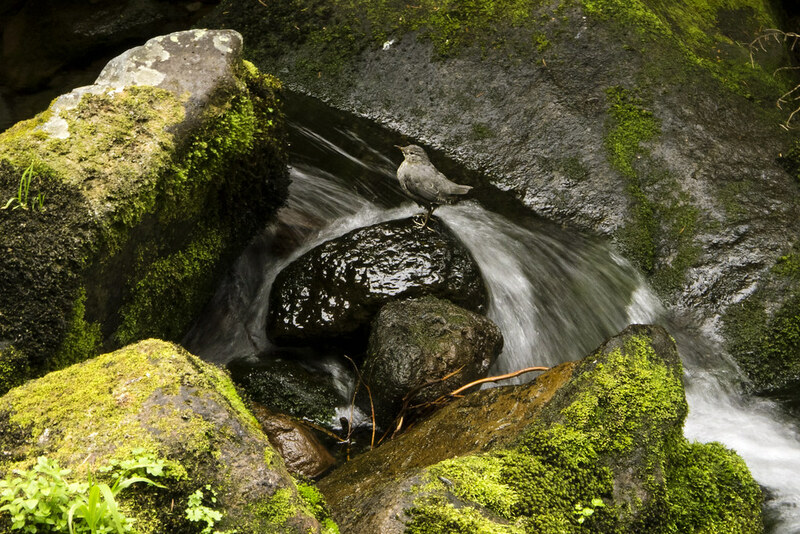 Few things are as refreshing as drinking all-natural water straight from a cold mountain stream, untainted by chemical treatments. Or to just plunge your face into a spring on a hot day and quench your thirst without fussing around with filters, pumps, and hoses. If you are smart about choosing your water source, you could go for days, weeks, or even years without treating your water and never get sick. It's a gamble, but after spending a few days stepping over moose poop, or seeing a bloated dead animal floating in a water source, or worse yet, having to witness your friend doubled over with stomach pains and running off into the trees to decorate that beautiful foliage in vomit or explosive diarrhea... I'm getting a bit off the rails here... what I'm trying to say is, that stuff kind of diminishes the "all-natural" romanticism of drinking from a cold mountain stream. So, I treat my water. My method for treating drinking water in the backcountry is a combination of household bleach (one drop per 16 oz.) and/or an inline or straw filter. And don't forget the often skipped step of cleaning your hands after touching potentially contaminated water. I carry a small bottle of hand sanitizer for this. Not doing so could negate everything you do to treat your water. Ingesting enough undiluted bleach is most definitely toxic, but according to the Centers for Disease Control, even in cases where household bleach was accidentally ingested undiluted, there have only been minor cases of negative health effects reported. Due to the horrible taste of undiluted bleach, it's unlikely that someone could accidentally ingest a dangerous amount. And since I only carry one ounce into the woods, which I heavily dilute over the course of a couple weeks, there's little I could do to harm myself with it. Bleach is also safe for the environment. If you accidentally spill some, it will dissipate in a few hours. It is also safe to dump unused bleach down a drain which leads to a municipal water treatment facility. While chemical treatments will kill most things in the water, none kill everything. And none work as well on protozoa, like Giardia and Cryptosporidium, as boiling and filtering. Bleach, however, is just as effective at killing protozoa, bacteria, and viruses as iodine, and nearly as effective as Chlorine Dioxide treatments, such as AquaMira. I can also add 4-5 drops of bleach to 8 ounces of water in a cook pot to sterilize my toothbrush, eating utensil, trekking pole handles (to keep deer away), and cook pot. And every thru-hiker, who lives for weeks without running water, knows how important it becomes to keep your toothbrush clean. Other chemical treatments will run about $10-15 to treat up to 30 gallons of water. A gallon of bleach runs about two bucks. The most I ever paid for bleach was in a small gas station near the Long Trail in Vermont, $3 for a half gallon. If stored at room temperature, bleach will last for 3-5 months from the day it's delivered to a store and a gallon will treat over 3,000 gallons of water. If the bottle is kept closed when not in use, the biggest factor that will shorten shelf-life is the storage temperature. That is because sodium hypochlorite, the active chemical in household bleach, breaks down quicker in higher temperatures. According to Clorox, the amount of sodium hypochlorite they add to their bleach depends on the season. They add more in the summer to compensate for the higher temperatures. Check your label. 6% hypochlorite is the norm, and the amount my recommendations below are based on. A higher concentration will last longer before it has broken down to ineffective levels. I've never had a problem finding bleach in a resupply town, regardless of size and remoteness. Most gas stations on the outskirts of town also carry it. I have had trouble finding other chemical treatments, however. That's why I tried bleach for the first time. I was in a decent sized town, but nobody sold iodine or chlorine dioxide-based treatments. I should also mention that if you're resupplying during a long distance hike, it is safe to dump what you don't use down a sink or toilet. Actually, it will clean pipes and keep them clear. It's also safe on a city's sewage system. If it's going to a septic tank, however, it could kill the bacteria needed for a septic tank to work properly. 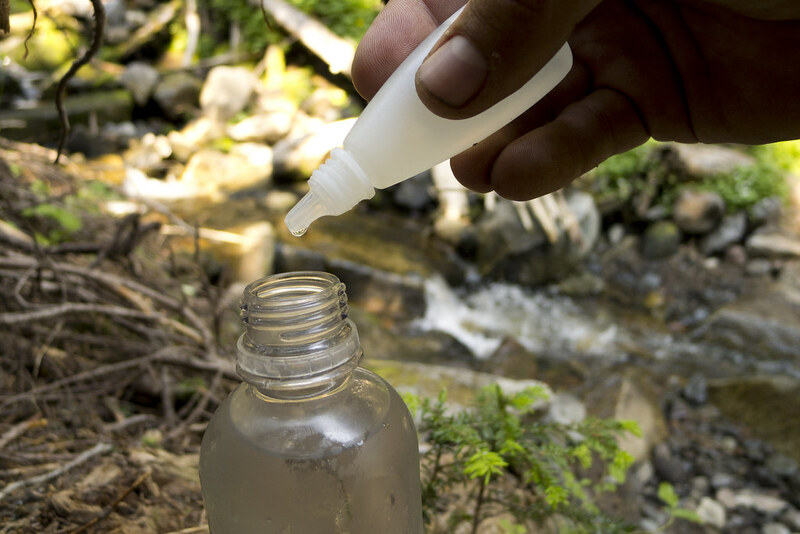 A one ounce eyedropper bottle full of bleach weighs about 1 ounce and lasts about two or three weeks on the trail. My method is based on recommendations by the Centers for Disease Control, the American Red Cross, and hours of additional reading. If you find any mistakes or have questions or suggestions, please contact me at grayson.ryan@gmail.com. I will always be happy to learn something new and will update this information accordingly. 1. Fill an eyedropper with bleach. Before heading out, I fill an eyedropper bottle with common household bleach. I use an old Visine bottle or breath drops bottle. Since bleach will degrade in direct UV light and become less effective, consider covering the bottle in duct tape, or paint, or something. To fill the bottle without spilling bleach, I often use a ZipLoc bag as a funnel. Put the desired amount of bleach in the bag. Hold it by one of the top corners, so one of the bottom corners is above the bleach. Cut a tiny bit of the corners off, then tip the bag and pour the thin stream of bleach into the dropper bottle. I keep the bottle in a ZipLoc freezer bag or in an empty wide-mouth Gatorade or Powerade bottle to prevent damage to gear and clothes. So far, I have not had a problem. Also, keep in mind, the decomposition rate of bleach increases by a factor of 3.5 for every 18° F increase in temperature, so if not stored at 60-80 degrees, it's probably a good idea to dump it out and replace it after a couple weeks to be safe. 2. Fill your water bottle with water. The best water source is actually the top few inches of lake water. The longer time under the sun’s UV rays does a lot of the sterilization for you. Otherwise, a spring or swift moving creek will be fine. 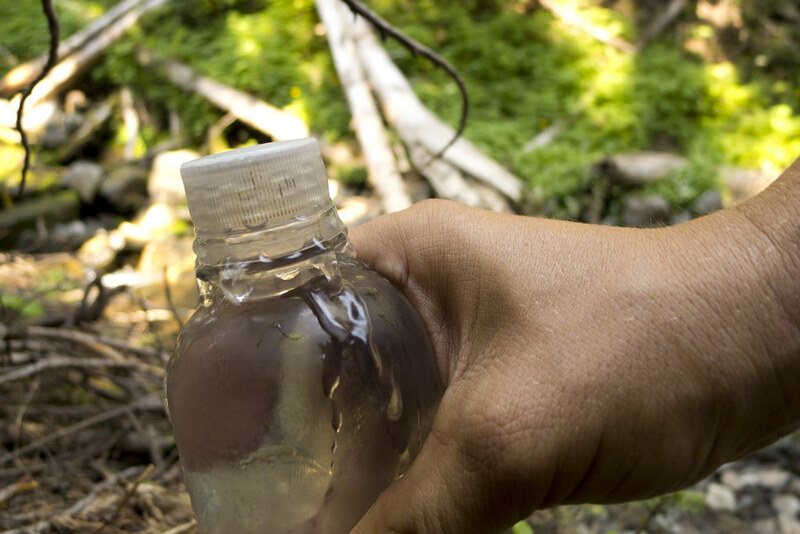 If the water source is not clear, I tie a bandanna around the top of my bottle when filling. If your water is still cloudy, let it sit until all sediment has settled, then pour the clear water into another bottle before treating. Chemical treatments are much less effective if the water is not clear or contains free-floating organic material. Organisms that are clinging to free-floating particles are harder to kill. 3. Add one drop of bleach per 16 oz. of clear water. Use two drops if the water is really cold, cloudy, or discolored. If your bleach is not the common 4-6% solution of sodium hydrochlorite you may have to use more or less. The amount of sodium hypochlorite added to bleach may depend on the season. More may be added in the summer to compensate for the higher temperatures. It could be as high as 10%, so check your bleach bottle’s label and adjust dosage accordingly. 4. Shake it like a Polaroid. 5. Screw the cap nearly all the way on, then squeeze the bottle until it starts to pour out, and then tighten the lid. This ensures that the entire bottle, including the cap and threads, get disinfected. 6. Wait 30 minutes. And in the meantime, clean your hands with a hand sanitizer. 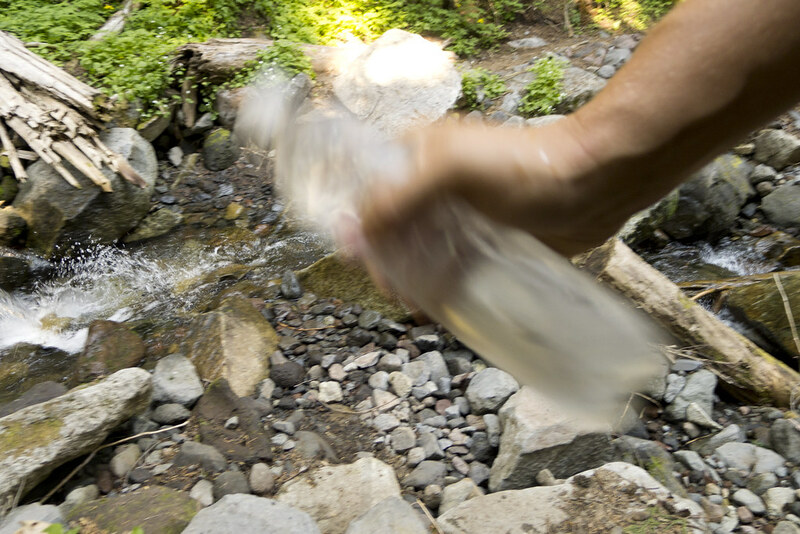 Not cleaning your hands after touching a contaminated water source could negate everything you have done to prevent a water-borne illness. If after 30 minutes, your water does not have a slight chlorine smell similar to municipal tap water, repeat steps 3 through 5. Think of bleach as an army of soldiers you're sending into battle. They kill organisms, but die in the process. The more organisms there are to kill, the more soldiers you need. That's why it may be necessary to treat a second time. And why sometimes you'll smell or taste more chlorine than other times. Keep in mind though, this isn't the fault of bleach alone. It's true for any chemical treatment. I've seen them fail on other hikers more often than I've seen them work. Must use lithium batteries, which are hard to find in small resupply towns. If alkaline batteries are used, you can usually expect to only treat 2-8 quarts, whereas Lithium may last up to 100 quarts. Not as effective if water is cloudy or discolored. Can leave threads of cap untreated. Heavier than my bleach/straw method. 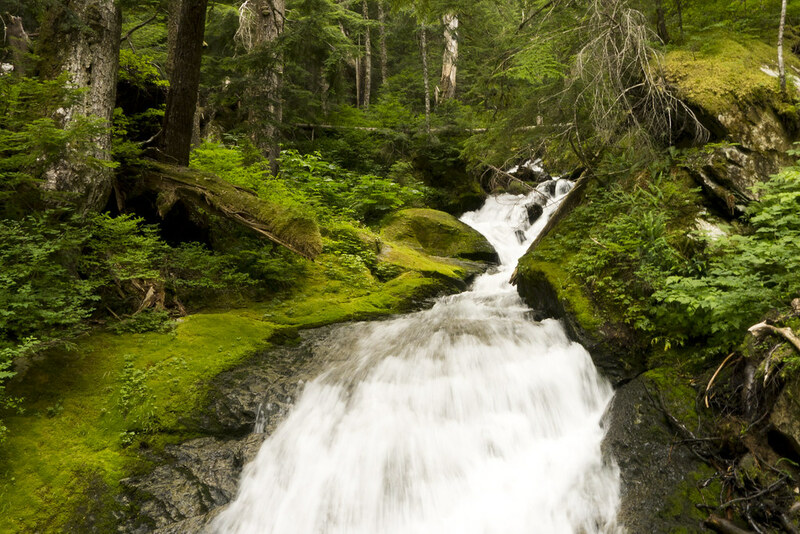 It varies from person to person and depends heavily on the outdoor temperature, but the rule of thumb is: Drink 1/2 to 1 quart of water per hour of hiking. On a hot day climbing up a mountain, your body can lose 1 - 2 quarts per hour from perspiration. It's pretty simple though, if you feel thirsty, drink. One way to determine how much water you are losing during exercise, is to weigh yourself before and after a hike or workout. Subtract about 7% from the difference in pounds (to account for the burned calories), then multiply by 16. That's about how many ounces of water you need to replace. I carry 2-3 plastic water bottles. One 16 oz and one or two 32 oz. That way, I can lose or break a bottle and still have a way to transport water. A hiker with a dog came to my shelter on the Long Trail in Vermont, and the dog decided one of my water bottles was a fun chew toy. I'm glad I had a backup. Another reason I've heard, for not reusing plastic soda bottles, is that bacteria can develop under the cap, but these get cleaned regularly during my bleach treatment, so I'm not concerned about that. And it's just as much a problem with Nalgene or Aluminum Bottles. Nalgene and other hard plastic or aluminum bottles cannot be squeezed to fill my cook pot with the Squeeze Filter. Or to get all the air out to treat the cap and threads when chemically treating the water. I've never been a fan of hydration bladders, since they are difficult to get in and out of my backpack, hard to see how much water you have left, and not easy to attach to the outside of any of my packs.